Vampire Beauties: Vampiress Review: "Vampire Camp"
The Gist: A vampire hunter puts together a camp to train people in the art of vampire hunting just for the camp to be overtaken by the undead. Clarification: This film is a campy low budget comedy. It's middle of the road campy so it's not annoyingly over the top. If there is any drawback I can think of its the annoying use of sound effects to the point that you want to mute the TV when people do things like eat garlic or drink. The main comedic premise is that the owner of the vampire hunting school does not recognize that his students are either disappearing or are vampires despite very obvious vampire stereotypical looks and behaviors. Part of that being because many of them are attractive women and he apparently gets very clueless when he's thinking with his "other" brain. Selling Point: Most of them are vampires in your classic sense. That means stalk and feed so you do get a few fang flashes. Female Vampire Factor: Basically all the females but two are vampires in the film and all can be seen front and center here (I said they were obvious right?). 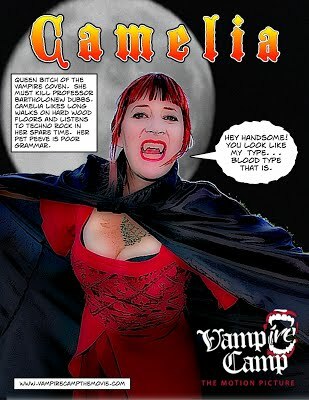 The main vampire in the film is Camelia (Cat Gould in red with cloak above). She is the mastermind behind the plan to infiltrate the vampire clan and her part in the plan is to seduce the hunter. Angela (Mallory Marie Wedding) is the only "non evil" vamp of the film. No fangs out of her during the film as she gets offed shortly after being introduced thanks to forgetting her sun block. I give it a Vampire Beauty Rating of 3 out of 5. More hits than misses as far as the comedy goes but is watchable at least once. It hints that there will be a vampireless sequel called Zombie Camp but I can't say I'm really looking forward to it.